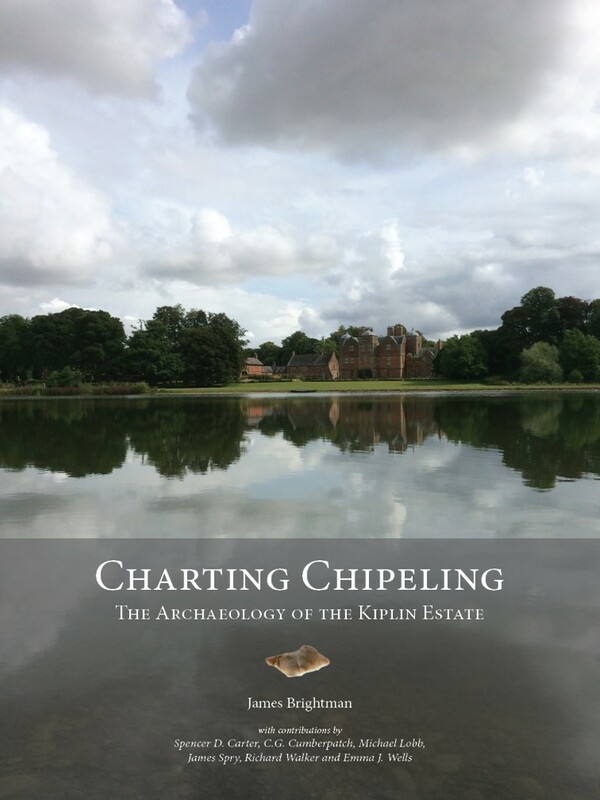 There are noises that suggest the delayed Charting Chipeling monograph about the archaeology of the Kiplin Estate in North Yorkshire may be heading towards print presses soon. In the meantime, and with Jim Brightman’s kind permission, here is the chapter on Lithics analysis and interpretation together with the full bibliography. I’m also pleased to have contributed to three other chapters, with Jim, on the excavations. On a personal note, things have been a bit on the quiet side much of this year due to some significant health issues. I’m glad to say the slow road to recovery is being travelled. Tees Archaeology and Historic England have just published a summary report about the North-East Yorkshire Mesolithic Project that completed recently. The report is aimed at a general readership and accompanies an illustrated e-booklet aimed at kids, as well as a guide to prehistoric lithics (flint). Although Teesside is perceived as a recent industrial landscape, the natural history and archaeology is all around. 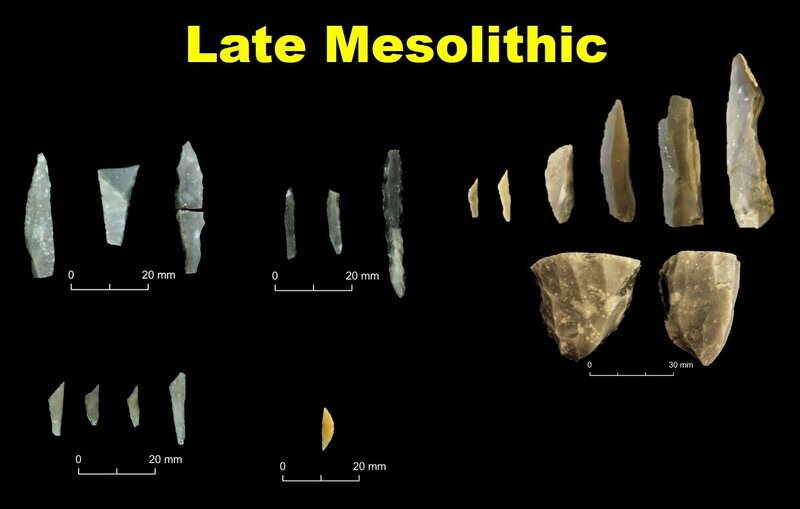 We have definite evidence for the early post-glacial pioneer colonisers, reindeer hunters, around 8500 BC—the Early Mesolithic—as well as evidence for the filling out of the landscape in the later Mesolithic into the advent of Neolithic farming communities and monument builders. This is a long six-thousand year epoch and one of rapid climate change, warm-and-cold events, rising sea levels, a tsunami, and the creation of today’s Island Britain. 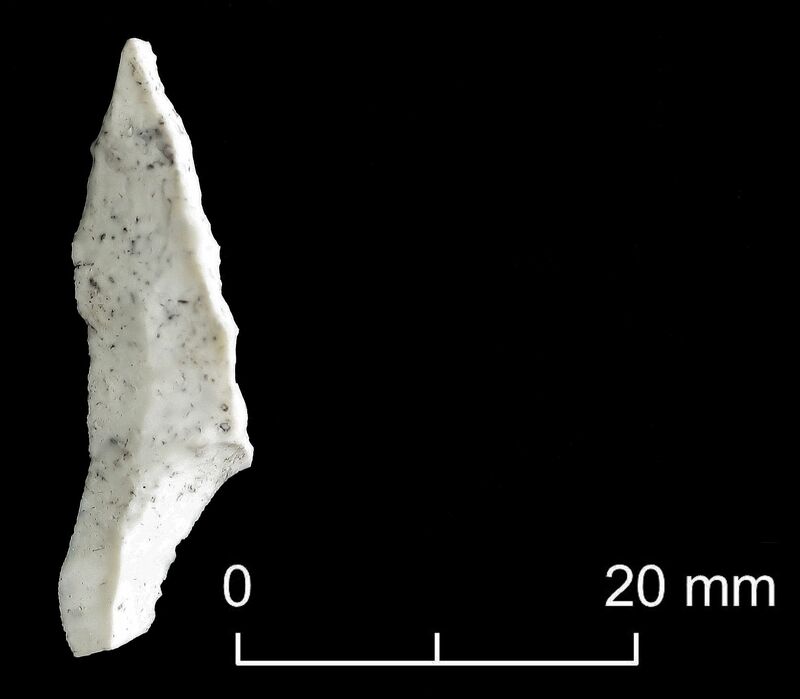 Early Mesolithic flint projectile point, Deepcar type, c. 8500 BC (a little later than Star Carr) from Eston Hills, Teesside. White flint has sources in East Yorkshire and Lincolnshire, many tens of kilometres away. These rare but characteristic tools are found along river valleys. Late Mesolithic flints from the North York Moors, c. 8000-4000 BC. Left are geometric narrow-blade microliths, usually used as projectile arrow barbs but also for other tasks; Top right are microliths and utilised flint blades; Bottom right is a core from which blades have been removed for working into tools. Coloured and speckled flint comes from beach and glacial till deposits on the NE coast and can still be picked up today. Some has been dragged over from Denmark and chalk beds now under the North Sea. It’s big, it’s two whopping volumes, it’s got a full lithic typology and analysis protocol (vol 1 appendix) — we’re liking that already. Swifterbant Stones: The Neolithic Stone and Flint Industry at Swifterbant (The Netherlands) by Izabel Devriendt (Groningen 2014).